Some of you will know that my father, who is 82, lives in our basement apartment. A few weeks ago my Dad told me he wanted to buy me “a nice pen.” He does not read this blog; he is not a computer user at all. But he sees me journal with fountain pens and I often show him my purchases. He especially enjoyed my vintage Waterman because it was made a year after he was born. 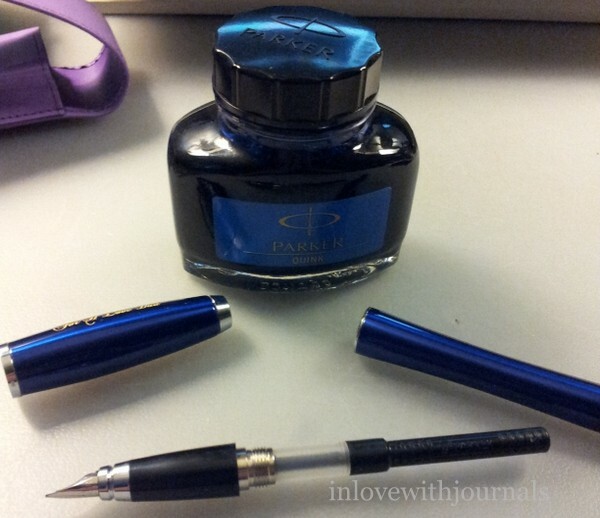 So when he wanted to buy me a pen I took to Amazon and found a Parker Urban in a beautiful royal blue. 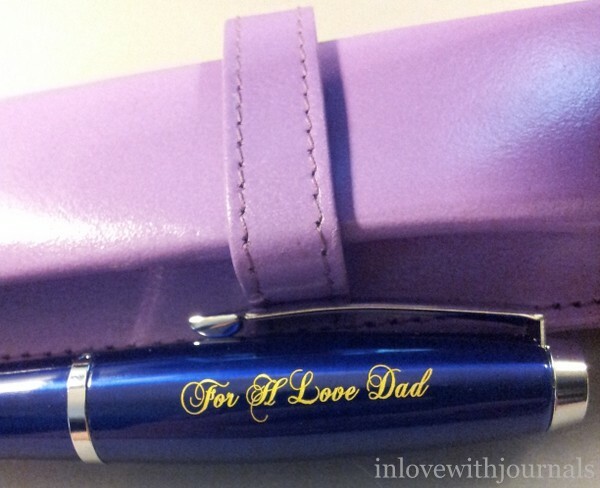 The pen was available from a London seller, and they offered free engraving and a gorgeous lilac pen case! It arrived this past Friday and I am absolutely delighted with it. Dad likes it too! I am a big fan of Parker writing instruments; I talked about my black Parker Urban in this post and see this post for my review of my Parker Vector calligraphy set. I use my black Parker Urban a lot so when I came across the royal blue one on Amazon I knew it would be a good addition to my collection. I’m really pleased with the leather pen case. The P doesn’t stand for Parker but for Pagani, which I assume is the maker of the case.”Pagani Collection, London” is stamped on the back of the case, and also on the underside of the flap. 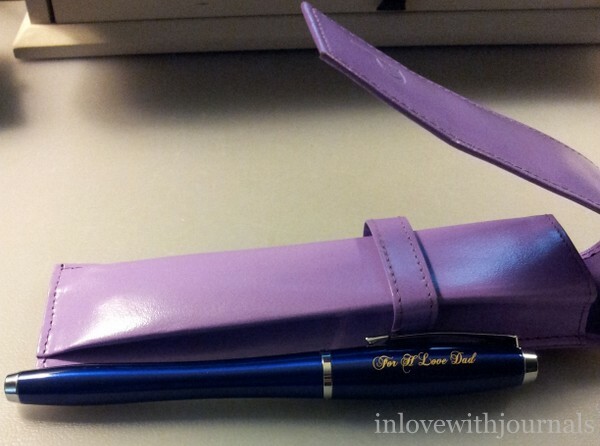 The pen sits comfortably inside the case, within an attached elastic. There is also a smaller elastic which can carry a pen cartridge. The case came with the pen inside as well as a cartridge. Here’s a close up of the engraving. It’s beautifully done and I love how bright it is, it really pops against the blue. I would have preferred the engraving to be in silver, to match the rest of the pen, but I have no idea if that was an option. I have to say the communication with the seller was less than ideal. I’m also hoping the engraving does not flake off – time will tell. I’m quite delighted with the finished product. As I said the pen came with a cartridge but I prefer converters so I popped my Parker converter in and filled it with Parker Quink Blue. The nib is a medium and super smooth. 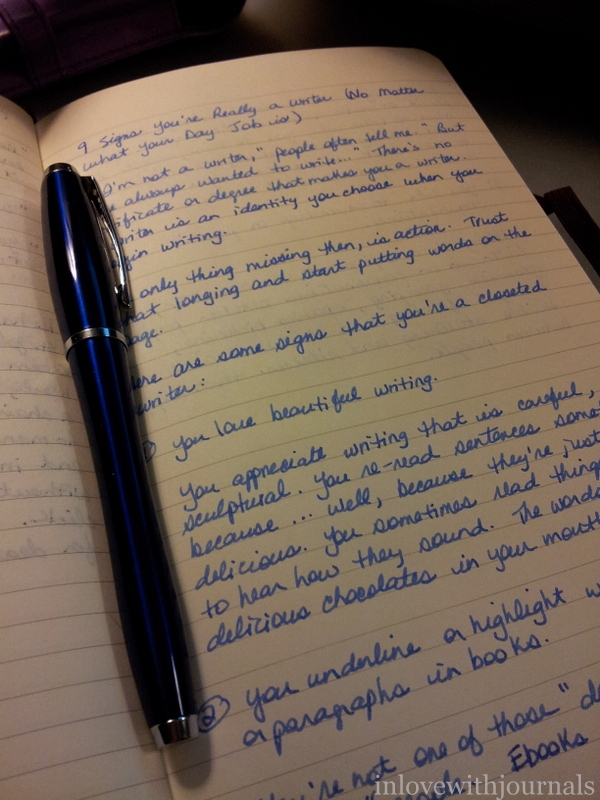 The shape of the Parker Urban really fits my hand so the writing experience with this blue one was just as satisfying as with my black one. 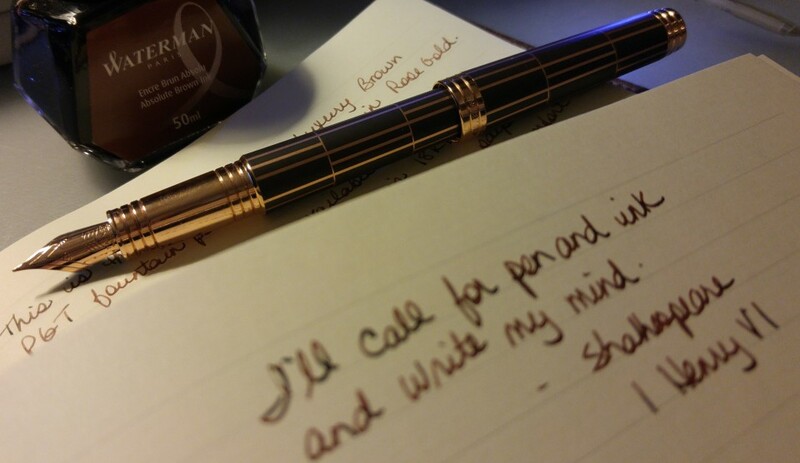 So that’s my new pen. It was a wonderful, unexpected surprise when Dad said he wanted to buy me a special pen. Mission accomplished. Thanks Dad! Great story thanks for the share. A gift sure to be cherished for a very long time.